For Europe to maintain sustainable growth and development over the next few years, it has become important for adequate investment to be made in Research and Development (R&D) particularly as it relates to science education and its resulting impact on the society. Europe is lagging behind its counterparts in other regions in terms of R&D, and it churns out more graduates within science, technology, engineering and mathematics (STEM) fields who do not necessarily take up careers in those fields. Also among the many challenges leading to the decline of interest in science education and careers is the often unattractive way in which science related disciplines are taught. Pupils are forced to learn by rote or memorizing complex science concepts with little focus on building the inquisitive mind-set which is key to scientific discoveries. With the Ark of Inquiry project, we aim to create “a new science classroom”, where pupils are able to learn scientific reasoning and Responsible Research and Innovation through conducting inquiry-based science education (IBSE) activities. Our goal is to provide more challenging, authentic and higher-order learning experiences to pupils and more opportunities for them to participate in scientific practices and tasks, using the discourse of science and working with scientific representations and tools. share and discuss the results of their inquiries with their peers. How do we intend to reach these goals? Find out more in the project objectives, where you will see that the Ark of Inquiry partners will undertake seven (7) main tasks that more or less correspond to the eight (8) work packages that the project activities are organized into. To understand what we have accomplished so far, check out the project deliverables that have been completed to-date! 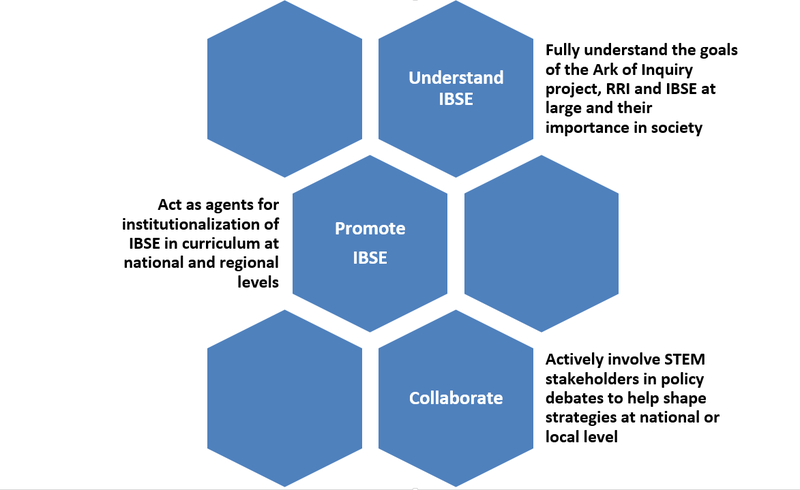 As policy-makers, you have a key role to play in ensuring that the “new science classrooms” are the classrooms in your country, so that the next generation in your country is given the opportunity to learn scientific reasoning and Responsible Research and Innovation through conducting inquiry-based science education (IBSE) activities first-hand. For more information on how to get involved, contact the local coordinator for the Ark of Inquiry project in your country – together we can build a brighter, more responsible and innovative future for Europe!